The persecution of Christians is worse than at any time in history — but it is being largely ignored by the UN and the international community, according to a report launched today (Thursday, 12th Oct). The new Persecuted and Forgotten? report, launched at a meeting in the Houses of Parliament this afternoon, concludes that the persecution of Christians reached a high water mark in 2015-17 — with growing attacks on the faithful by Daesh (ISIS), Boko Haram, and other fundamentalist groups. According to the report, produced by the UK office of Catholic charity Aid to the Church in Need, the international community has failed to adequately respond to the needs of Christians attacked by militant extremists. Persecuted and Forgotten? states: “Governments in the West and the UN failed to offer Christians in countries such as Iraq and Syria the emergency help they needed as genocide got underway. The report also identified growing problems in certain majority Islamic countries and authoritarian states such as Eritrea and North Korea. Report editor John Pontifex said: “In terms of the numbers of people involved, the gravity of the crimes committed and their impact, it is clear that the persecution of Christians is today worse than at any time in history. Although the report found in the countries under examination that many faith communities have suffered at the hands of extremists and authoritarian regimes, it concluded Christians have experienced the most hostility and violence. The report supports this claim with a series of examples showing the extent of the problems facing Christians in each of the 13 core countries it assesses in depth — as well as providing an overview of the state of religious freedom for the country’s various denominations. Persecuted and Forgotten? found that members of China’s 127 million-strong Christian population have suffered increased persecution following new attempts to bring Christianity in line with Communist ideals. More than 2,000 churches and crosses have been pulled down in China’s coastal Province of Zhejiang — and clergy are still being routinely detained by authorities. During the campaign of genocide by Daesh and other Islamist militant groups in the Middle East, Christians were disproportionately affected by the extremists. In Iraq, more than half of the country’s Christian population became internal refugees and Syria’s second city of Aleppo, which until 2011 was home to the largest Christian community, saw numbers dropping from 150,000 to barely 35,000 by spring 2017 — a fall of more than 75 percent. Despite national governments and international organisations having determined that a genocide has taken place, local Church leaders in the Middle East have repeatedly said that they feel forgotten by the international community. A number of bishops in the region have accused the UN of overlooking the needs of displaced Christians, despite pledging to deliver aid “neutrally and impartially”. Extremism has been a growing problem in Africa — particularly in Nigeria where Daesh affiliates Boko Haram have displaced more than 1.8 million. 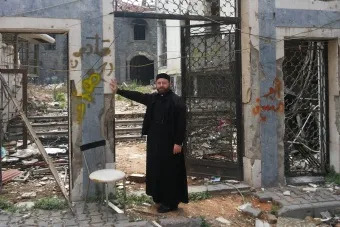 In one diocese alone — Kafanchan — within five years, 988 people had been killed, and 71 Christian-majority villages had been destroyed, as well as 2,712 homes and 20 churches. At the launch in the House of Lords, to be chaired by Lord Alton, Archbishop John Darwish — who has overseen the care of Syrian Christian refugees denied UN aid — will give a first-hand report about the crisis that has faced Christians and ACN’s John Pontifex will present the findings of Persecuted and Forgotten? Other speakers are to address various aspects of the report. Bishop Matthew Kukah from northern Nigeria will speak about Christians living with violence from Boko Haram and other extremist militants. Work resettling displaced Christians in the towns and villages they were driven out of by Daesh in northern Iraq will be described by Father Salar Kajo, who helps oversee the programme returning displaced families to their homes on the Nineveh Plains.